Ever since we moved in to our house, I have dreamed of painting the kitchen cabinets. I was never a fan of the orangey oak look. There’s only one window and the wood cabinets make everything feel dark. So, this time I suggested to Michael that I paint the cabinets white… and still he insisted that he liked them the way they were! Never one to be deterred, I hung on to my dream. And then in May, a friend of mine was over to help me bake a cake for the incomparable retirement party and we were discussing painting the cabinets. She was totally on board and encouraged me to do it! When Michael got home that evening, I mentioned that my friend thought we should definitely paint the cabinets… and a couple of days later he came to me and said that maybe the cabinets would be nice painted. Make a shopping list and go to Lowe’s for supplies. :) Then go to fancy paint store for fancy paint only to find they don’t keep it in stock because no one buys this paint, (What?! No one from blogland shops here?) so they have to order it for you. Come home and clear kitchen. I am not painting the inside of the cabinets because 1) they are laminate, 2) I don’t have the patience and 3) who would really notice anyway? so I left all the food and dishes in the cabinets. Remove all extraneous items from countertops. Remove all hardware from doors and drawers. Remove doors and drawer fronts. Make sure you label your doors and drawers in a way to help you remember where they go back. This will save you time when you are reinstalling them. I labeled mine on the back where the hinge plate will go. Lay out doors. I chose to do all my painting in the basement where I have a ping pong “work” table and I can shut the door to keep the cat out of my fresh paint. I ended up using three additional tables to fit all 19 doors and 9 drawer fronts. I used little foam blocks to elevate all the pieces. Begin cleaning doors with soapy water. Go back to paint store and pick up special order paint. Clean cabinet frames with soapy water. Putty all holes and imperfections in frames (I bought identical new hinges so I’m reusing the old holes, so those were left alone.) Sand putty. Caulk seams between cabinets. Here is where you insert a step that I skipped. I didn’t sand the frames or use deglosser on them before priming. Sanding dust would get all over everything in the kitchen including all my dishes, so I wanted to avoid that mess. And deglosser is full of stinky, dangerous chemicals and I didn’t want to stink up the upstairs to the point of us having to move out… so, I simply scrubbed the cabinet frames clean and then roughed up the sides with a sanding block. I am using Zinnser Bull’s Eye 1-2-3 water base primer which supposedly will adhere to glossy surfaces and even laminate without sanding or deglossing. I used this primer when I painted my vinyl backsplash and everything has held up just fine, so fingers crossed! Caulk baseboard seams (because I forgot to do those on Day 2). Prime under the upper cabinets. Finish cleaning doors with soapy water. Fill in any holes or imperfections in the doors. I am reusing the old hardware holes, so I left those alone. Sand doors with 150 grit sandpaper. (I only sanded the flat parts on the front and back since I was going to degloss them, too.) Wash doors again with soapy water to get rid of sanding dust. Clean the doors with liquid deglosser. Wear protective safety equipment! (I used the regular old-fashioned kind of deglosser because that’s what was available at my store, but I recommend you find the low VOC one, because this stuff is toxic and flammable and I do not like it! I was paranoid the entire time I was using it that it was going to spontaneously combust and I would be consumed by a fireball. Then who would finish the kitchen cabinets?!) Let deglosser dry. Get a second wind and prime the backs of the doors. (Start with the backs, so when you flip them over to do the fronts if anything gets scratched, it will be the back.) I brushed the edges with a 1 1/2” angled brush (I like Purdy brand) and rolled the flat planes with a 4” foam roller. Four doors in I realized that all my sharpie numbers on the back of the doors had been eaten off by the deglosser! So I had to stop and figure out where all the doors went and re-label them. This time I just wrote the number on the drop cloth (or table) in front of each piece. I’ll just be sure not to move them until they are ready to hang! :) Let your primer dry 24 hours. Flip all the doors over and prime the front side. Apply second coat of primer to the baseboards (they were black so it took two coats to cover) and cabinet frames just to be sure you cover all stains (especially important since I didn’t sand/degloss!) Let everything dry 24 hours. Again I brushed the edges and the grooves in the molding and then rolled the flat planes. It took about two hours to paint the 19 doors and 9 drawer fronts. This is the part of the process where you hurry up and wait… The back of the can said the paint would dry to the touch in 2-4 hours and to recoat after 16. So, I honored the paint gods and let the doors dry until the next day. Vacuum and dust the kitchen again and rehang the sheet “doors” to keep out the pets. Apply the first coat of paint on the cabinet frames and baseboards. I used a brush to cut in the edges and a 4” roller for everywhere else. Apply a second coat of paint to the back of the doors. Vacuum and dust the kitchen again! Aaaargh… this is the problem with trying to paint cabinets in a kitchen that you are still using! Better safe than sorry, so clean up first! Apply a second coat of paint to the frames and baseboards. Carefully flip all your doors over and settle on the foam blocks. Be gentle, that’s barely cured paint on the other side! I had a couple that stuck to the blocks and peeled a little of the primer off the front side. So I had to lightly sand and touch-up the primer before I painted those spots. Apply the first coat of paint to the front of your doors. You can really see the brushstrokes melting away as the paint levels out. It’s pretty cool! I found that the brushstrokes leveled faster than the roller marks, but it’s faster to roll the big areas than brush them, so I continued with my technique. Now let ‘em dry for 16 hours! The next step was to apply a second coat of paint to the fronts of your doors. When I went to begin, I noticed a lot of grain lines/stains? bleeding through my first coat! Aaaaargh!! I figured I could just keep slapping paint on top of it and hope it went away OR I could bite the bullet and put on another coat of primer. This development really annoyed/depressed/exasperated me and made me wish I had just left the stupid cabinets wood!!! But, I am a big girl, and I can handle setbacks with a lot of whining and some cookies grace. I decided to just do the primer again in hopes that it would seal whatever was seeping through and I could get back to my original timeline which was now a day behind. Grrr! This is why it is important to seal all the bleed-through with primer BEFORE you start painting. Preparation is ultimately the most important part of the process, Sarah!!! Anyone can slap a coat of paint on something… but if you skip the prep you will regret it! I did two coats of primer on the frames and I didn’t have any bleed through. So… after you begrudgingly go back and prime some more, wait the agonizing 24 hours for the primer to work its magic before painting. Apply another first coat of paint to the door fronts. Here is a look at my excellent technique. :) After 8 days of washing my hands over and over to get all the paint off, I finally decided to wear gloves! Fingers crossed that all the stains are sufficiently covered… wait 16 hours, again. Examine your doors and decide if a third coat of paint is needed. I decided that two coats was enough, but I had a few touch ups where a stray cat hair had landed in the paint, and also a gnat decided to get stuck on one of the doors, too, so I just sanded them out with 320 sanding block and repainted. Ideally, you should lightly sand between every coat, but I didn’t bother because my cabinets are not in perfect shape to begin with. Who is going to notice all those tiny imperfections? NO ONE! :) I kept telling myself that it doesn’t have to be perfect, it just has to look good. Preparation is the most important step. Quality paint and primer are the second most important. Be patient… painting your cabinets takes time. Expect to spend at least two weeks in disarray before your kitchen is restored. YOU CAN DO IT! 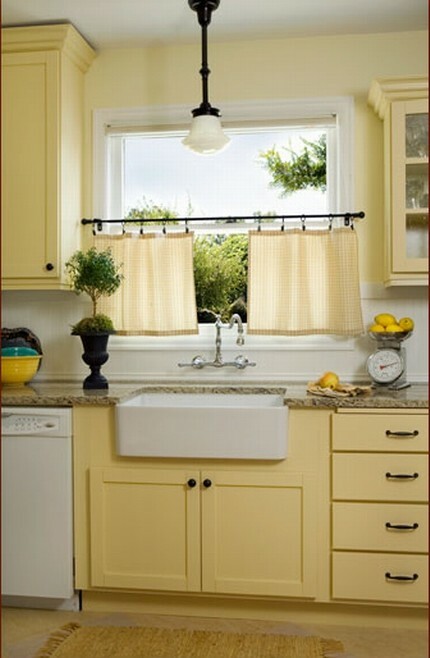 Don’t let naysayers deter you; painting cabinets can be a DIY project! See you next week for the big reveal!! Update: Check out the reveal here! I am totally exhausted from just reading this and greatly admire your ability to follow through...you go girl!!! Thanks for sharing the work you did to kitchen cabinet.